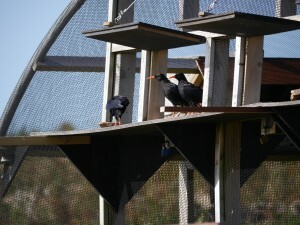 At the end of August the aviary quarantine restrictions were lifted and the birds there were poised ready for release. On 1st September the release hatches were opened at 17:00 allowing the chicks to have 30 minutes access outside. The hand-reared chicks were the first to leave. Already having experienced the joys of ‘free-flying’ they headed straight to the cliffs to join the adults. Not wanting to be left behind, the parent-reared chicks followed. Having never flown outside of an aviary before, their flight was noticeably sluggish compared to the hand-reared chicks. This changed very quickly once they got used to using the air currents. Grace and Helier seemed a little confused by the situation and didn’t fly out of the aviary straight away. They watched the others flying around and both groups called back and forth. Grace and Helier eventually ventured out once the other chicks returned to the aviary for a respite. The chicks were obviously very excited about being on the other side of the aviary netting. Hard to say if the adults felt the same? One could infer that feelings were mixed from the fact that three decided to fly off to Sorel Point once the chicks arrived. 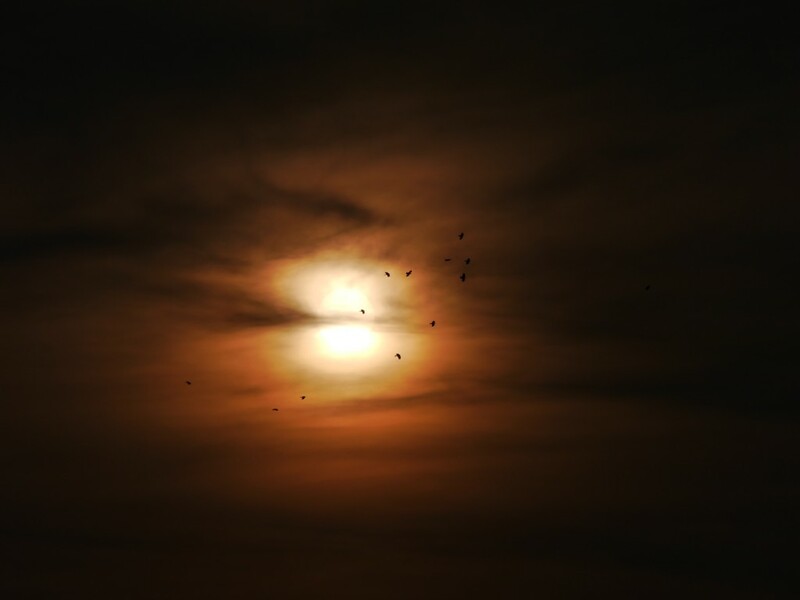 The chicks started to follow them flying a couple of hundred feet high in the sky, but decided to turn back and returned on their own accord to the aviary. Eight of the chicks went inside and their keeper locked them in at 17:30. Considering Grace’s reluctance to leaving the aviary she was one of the last to return. Grace and Jean remained outside. It was not clear whether this was out of choice or because they could not work out how to get back in. The team called them down to the outside target-boards to encourage them in. It worked for Grace, but Jean remained outside preferring to stay on the roof. The adults reappeared at the aviary. Possibly responding to hearing the call for food. This seemed to encourage Jean away from the roof down to the release hatches where the adults were. She calmly landed on the shelf and walked inside the aviary looking for food. The team were then faced with an unusual problem in that the adults were sat either above the hatches, or on them as was the case for Mauve. This hasn’t happened before. Normally the adults fly off as soon as they see someone make an attempt to reach the hatch wires. They were probably waiting for their last supplementary feed of the day. The hatches had to be closed, which caused the adults to take to the air, but at the same time their keeper called them back for food and they happily returned to feed. That meant that the last chick was locked in for the night at 18:45. Cutting it a bit fine before roost time yet still this was a very successful first day. The next few days proved even more successful with all the chicks going out, flying around and exploring the cliffs, feeding in the grazed fields and returning to the aviary to be locked in before roost. Each day the time of release was brought forward by one hour. There was only one close encounter with a peregrine during this soft-release. The peregrine had swooped down on a mixed flock of pigeons, crows, and gulls feeding in the conservation fields. It had claimed one victim, but dropped it before reaching the aviary. 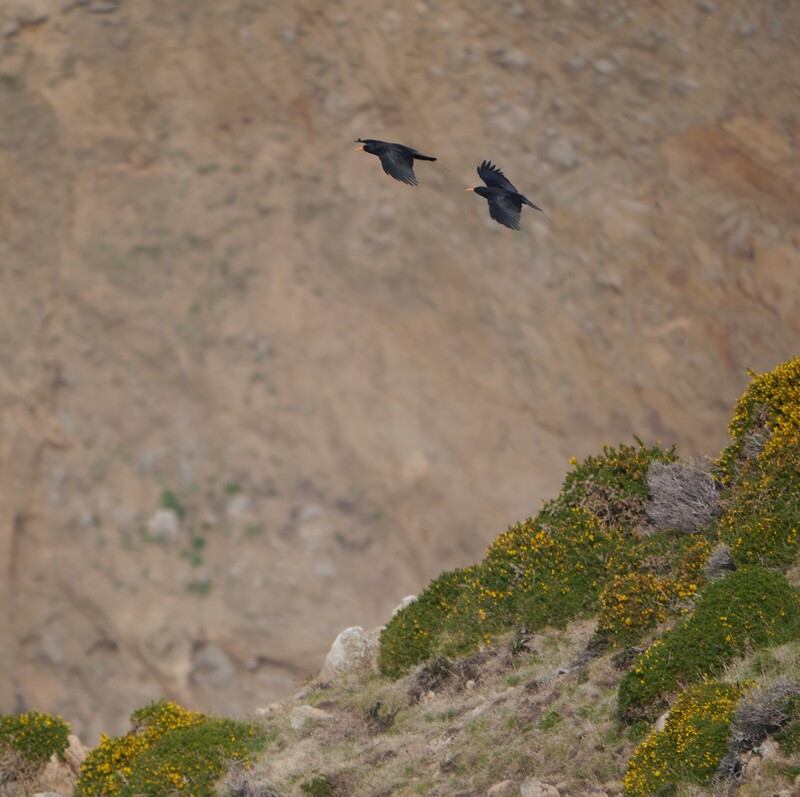 It then spotted the flock of choughs by the cliffs and flew at them. Luckily it missed. When they fled to the aviary it gave up and flew off empty ‘handed’ out to Sorel Point. The rest of the soft release was fairly uneventful in the drama stakes. There was a visit by a short-eared owl on two occasions. The quarry’s blasting sirens rang loud and clear during one release. The birds showed no reaction; the team did find it a little surreal though. An interesting turn of events, however, was the adults’ reaction to having access to the aviary again. They loved it. So much so that by the end of the week it was getting quite difficult trying to get the adults out of the aviary at lock-in time. We ended up leaving them in on Day 7. There was no real concern over fighting or stress within the group, yet the team were still relieved to see everyone ok the next morning. We locked them all in again on the 8th night. On the morning of Day 9 the group was called for food in the aviary first thing then the hatches were opened. They have stayed open ever since. The trial release programme in 2013 had less than a dozen release days spread over a six-week period and then had to be postponed because of bad weather and an injured bird. When these birds were let out again in April it took twenty-five release days over a six-week period before we could confidently let them out full-time. For the group of ten chicks it took one week! 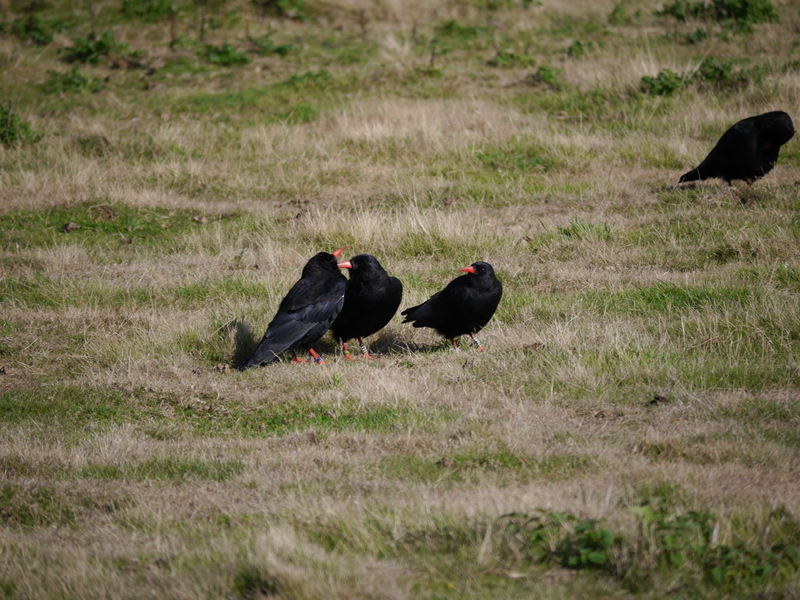 Obviously the chicks had an advantage of having other choughs out at Sorel as role models, yet no one would have predicted the process to happen quite so quickly. In some respects that is the easy part over with. We now need to monitor these birds closely, ensure that they have enough food over the winter, and have all their needs catered for when next year’s breeding season rolls around. Please feel free to send in any of your sightings or encounters to the website. We always appreciate extra eyes on the ground (or air!) and we are very keen to hear how the residents of Jersey are taking to their new neighbours. Once the chicks had 24-hour access outside, our radio-tracking study got underway. 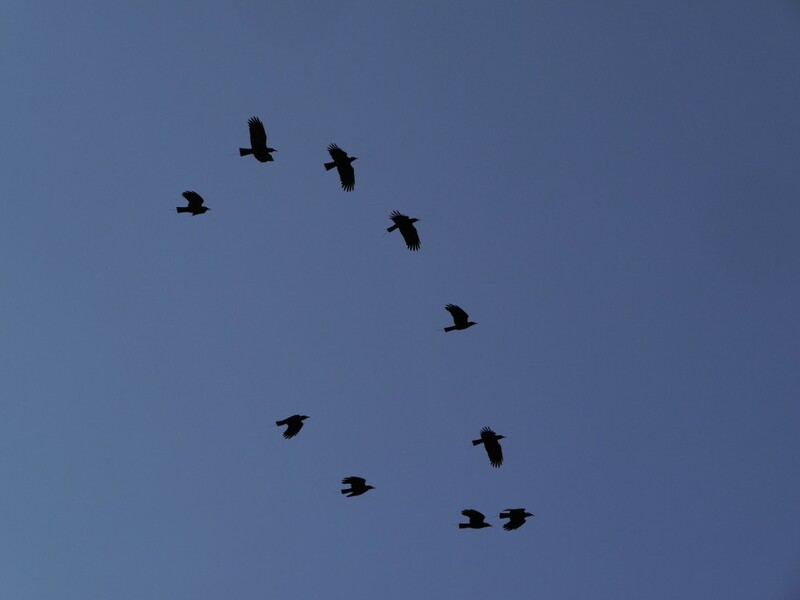 We follow one bird per tracking session recording location, behaviour, and proximity to other choughs. We alternate the focal bird so as not to bias observations. Since we are recording proximity we are, in effect, checking up on all 16 birds per session. There are six tracking sessions per day starting at 07:30. The last session of the day is set at 19:00 to give us an idea about roost site selection. Obviously, as the days get shorter, this late session will become redundant. 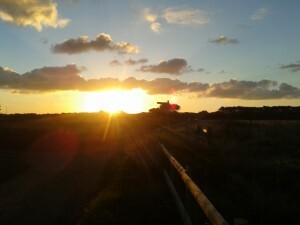 Both sunrise and sunset can be quite spectacular at Sorel and shed interesting light on chough behaviour. For the first week or so of living at liberty the choughs would be enjoying breakfast either at the aviary (provided by the team) or on the grazed land probing for wild insects. We then started to notice the birds flying around Mourier Valley and only returning to the aviary when we blew the whistle for food. We decided to stop providing them with breakfast as they were obviously beginning to explore and learn where other sources of food were. Next thing we knew, they are shooting out of the aviary at the crack of dawn and feeding over at Devil’s Hole before meandering back to Sorel for lunch and an afternoon hang-out. We have also watched them take several flights over to Crabbé and over Rouge Nez. We have never observed them land, but we are sure it won’t be long before they start investigating the short grass at the gun range. Sunset checks can be frustrating because the choughs’ behaviour can vary each day. Some nights they want to head to their roost site before sunset. Sometimes they can be probing for food right up until the last slither of light. The adults returned to roost at the aviary the first night we left the hatches open for the chicks. It is a lot harder to know where the adults roost now they have moulted their transmitters. We have to spend a good thirty to forty minutes before sunset watching them to see where they go. We are now seeing our external roost-boxes being used more. Not surprising with sixteen birds competing for a roost spot. Fortunately Sorel is quite quiet at roost time with most tourists and dog walkers having headed home meaning that the birds can settle down for the night at the aviary and not be scared away. Max and Adam sadly had to say goodbye to us this month. Max returned to University in Germany to continue his studies. Adam finally bowed out after six months on the project, having initially volunteered for three! Both have been an immense help on the project and have, we are sure, learnt a lot in the process. A special thank you must be given to Adam who stood in when Harriet and I went to Cornwall in July. Not to mention the endless search effort for the missing birds in April and being the one to find Yellow’s signal 9km away from the aviary! Adam’s time on the project is documented on our website, shortly to be followed by Max’s story. New student Will Campbell joined the project in September. Photo by Harriet Clark. 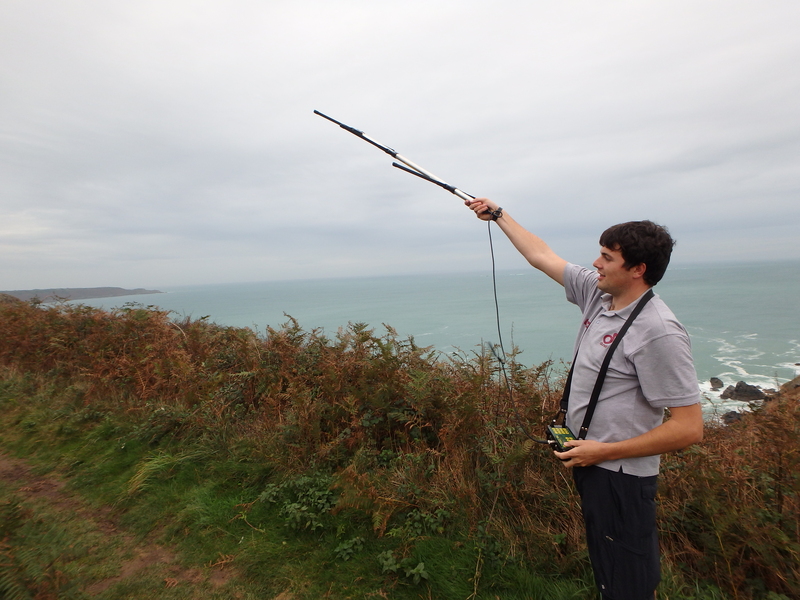 Will Campbell, our new graduate student from Jersey, shadowed Adam in his last week and was thrown straight into radio-tracking the chicks. The success with the chick release meant that Will missed the entire soft-release, but he has been following them ever since. Will had the added pressure of being the only student during most of September. We are hoping he will rise to the challenge and not do a runner like Yellow and Cerise! ….her transmitter that is. 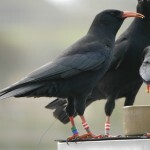 All the choughs were accounted for on the morning of the 27th, yet Bean’s transmitter was silent. The team eventually found the signal emitting from the roof of one of the quarry store-sheds by the offices. The transmitter has not yet been recovered and we are waiting for one of the gulls who sits on the roof to kindly dislodge it for us. Thankfully, Bean is quite a communal chick and hangs out with the others so she has been easy to follow. It does make it a little bit more difficult when they are flying as we cannot see the leg rings. We used to be able distinguish adults from chicks by presence of the tail transmitter. Not to be upstaged, exactly a week later, Caûvette’s transmitter started playing up. At first it was just the pitch that had altered then very quickly the battery died. We have contacted the manufacturer to try and understand why this would have happened so soon. Normal battery life for this model is nine months. With the transmitter still attached to the bird it is a little difficult to diagnose. Hopefully the other eight will hold out over the next six months and stay attached to the birds. The intriguing trio of Green, Mauve, and Blue continues. On the whole, Green spends more time with his new interest, Blue, than his old partner Mauve. Yet still they feed together and Green will preen both as they stand together in their sordid triangle. We think Mauve might be starting to take offence (finally) and has been seen alone on occasion several hundreds of metres apart from the rest of the group. This behaviour started on the morning of the 15th when Mauve didn’t show for breakfast and returned to the group and the aviary four hours later. There was no sight or sound from her in between. Maybe at the start of the breeding season, as hormones start playing their part, Mauve’s stubbornness will shine through and she will win back her ‘man’. 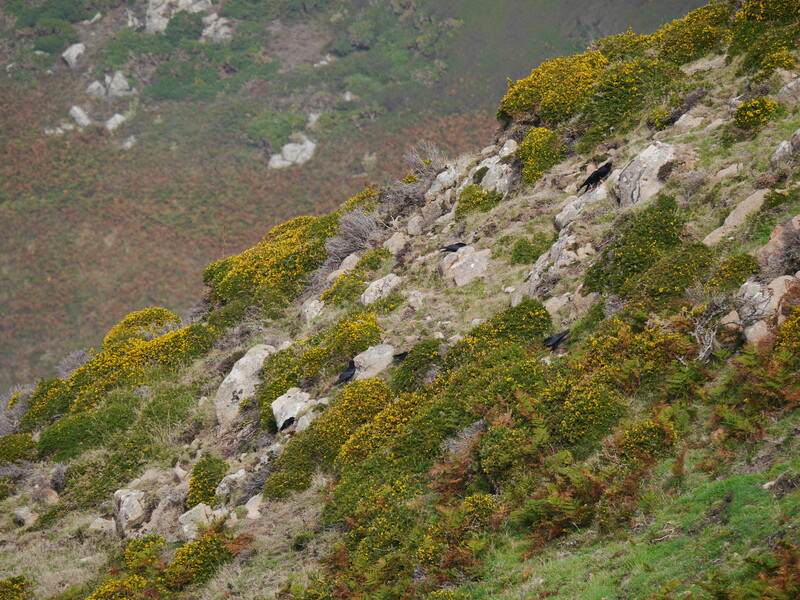 That or she will pair-up with a younger chough and we will have two potential breeding pairs to look out for. 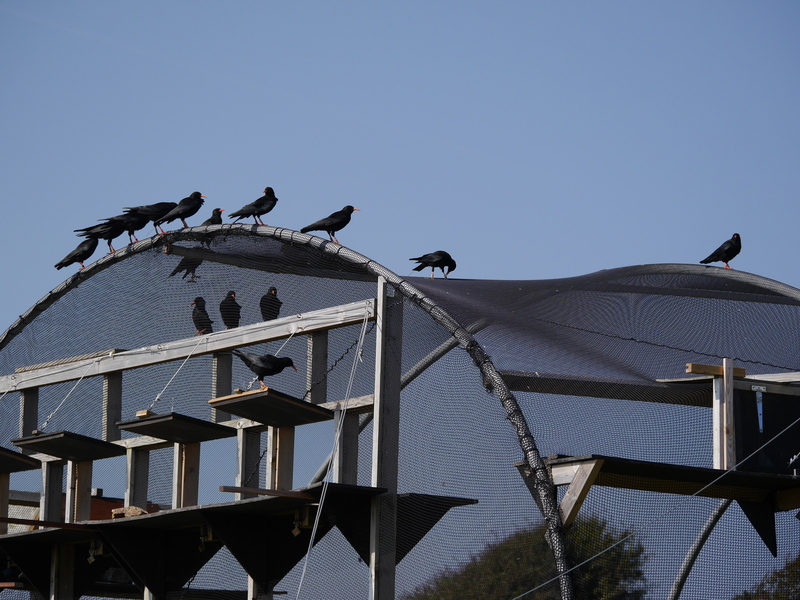 All of Durrell’s captive choughs have been moved off-show whilst their aviary awaits major repair work. Gianna loves the attention she is getting from Academy staff watching her from their offices and from the Security staff who walk past every day. Tristan has been demonstrating unusual behaviour suggestive of breathing issues. However, after inspection in the hand and faecal and blood testing, no conclusive diagnosis could be made. He is on an anti-inflammatory drug and will continue to be monitored carefully by keepers. 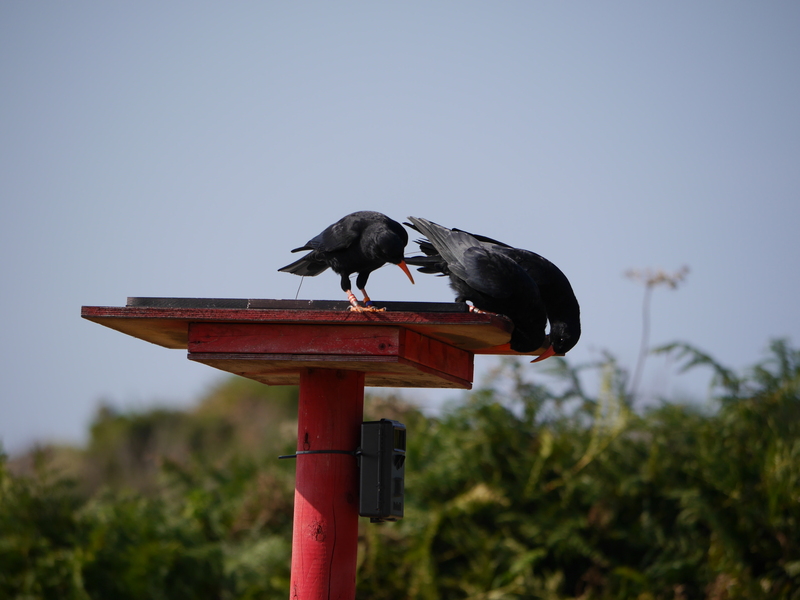 Our study into what the choughs are eating in the wild got into full swing this month. Will is working on an invertebrate key based on previous studies specific to Le Don Paton. Faecal samples are starting to be picked apart in the lab to first separate into animal, plant, mineral, and then to genus level. We will be setting out pitfall traps to help ascertain what is available at this time of year and to help with our identification of faecal finds. We hope to extend the invertebrate survey to study monthly and seasonal variations in prey availability. Choughs don’t just eat insects in the ground. 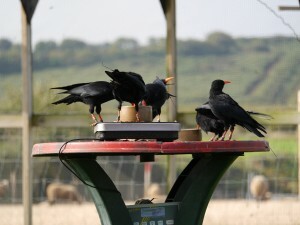 Our choughs have taken a great interest in sheep faeces. We know that in the UK choughs probe cattle dung for larvae but we were quite surprised at how much can be found in smaller sheep faeces. And we were completely taken aback when we watched our choughs playing with the poo! Caûvette, for example, was seen on her back, legs kicking in the air, tossing a piece of poo around with her bill. And, no, she wasn’t stuck! 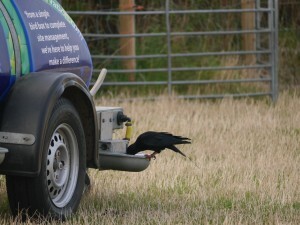 Chough drinking from the sheep’s water trough. Photo by Liz Corry. An unexpected benefit of having the sheep around is that the choughs have learnt to drink from the water bowser left out for the sheep. We provide them with two sources of fresh water at the aviary, cleaned out every day. Understandably then it is a little bit insulting to the team when the choughs choose the water pans left out, green with algae. We have started scrubbing out the pans to keep the water clean. Hopefully the choughs are sensible and drink from these because they are shallow. 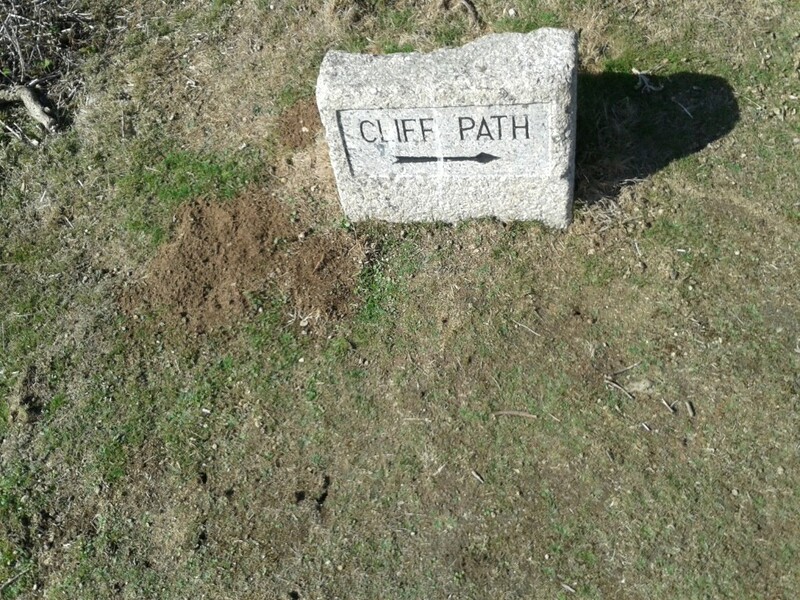 There have been a couple of reports in the past where UK choughs have fallen into horse troughs and drowned because the sides are too steep and slippery to get out of. The birds have also been in the hawthorns by the aviary picking at the berries and the bark. We have found pellets containing undigested seeds suggesting that they are eating the fruit. Presumably when they are pecking at the bark they are looking for woodlice and other such invertebrates. 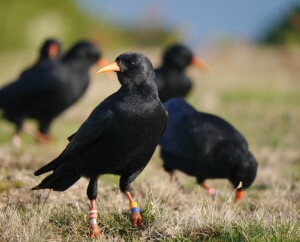 At the same time choughs are highly inquisitive and could just be investigating. 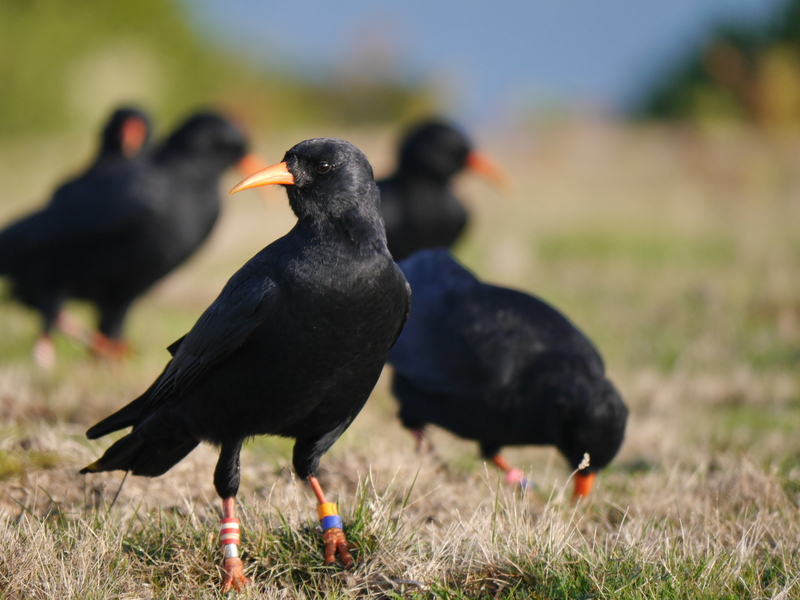 We would like to use next-generation sequencing to look more closely at the question of prey selection by released choughs. This would feed into answering (no pun intended) how much the choughs are reliant on our provision of food throughout the year. This sort of genetics study requires funding and institutional support potentially incorporated into an MRes or PhD. 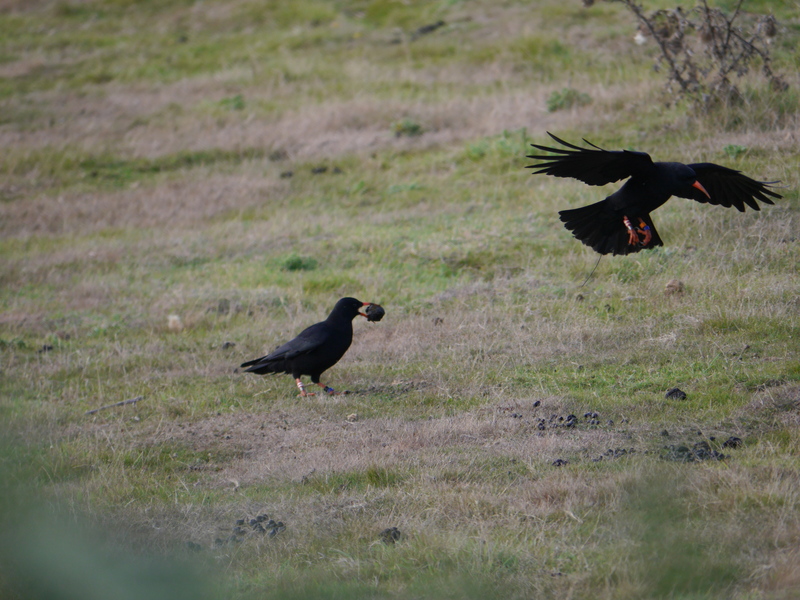 With the choughs flying free it is more important than ever to know how well they are adapting to finding food in the wild, how necessary the supplementary feed is, and to monitor their general body condition. We do this by checking their weights each day and their physical appearance at feeding times. Now we have sixteen birds flying to one weighing scale it is very difficult to get daily weights from every individual. To compound the problem certain individuals, not naming names… Dingle, Chickay, and Caûvette…head straight for the scales and push off anyone else who tries to feed. We will be looking to purchase a second set of specialist scales (approximate cost £200) to allow simultaneous weighing. This might not solve the problem, but will certainly alleviate it. We have tried to continue the behavioural observations to see how group cohesion prior to release, affects behaviour post-release. 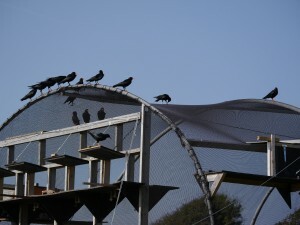 The obvious obstacle to continuing observations is that the birds are no longer confined to the aviary. 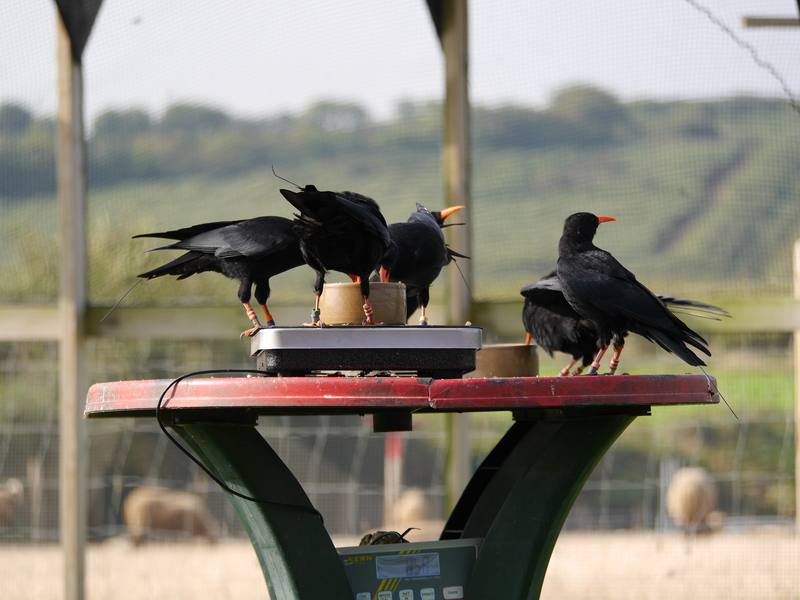 Thankfully with the way choughs flock together at this time of year we can focus on feeding sites and simply adapt the methodology. What we can’t manipulate though is the choughs’ penchant for rabbit holes. The terrain at the feeding sites often means that the birds’ leg rings are hidden. Or, in the case of a rabbit hole, the whole chough can be blocked from view. The birds also tend to spend only a few minutes feeding in one area. With the two issues combined, and our other project commitments, we end up only getting 10 to 15 minutes of observations once or twice a day. We may have to discontinue this study unless we can outsource to a student intern who can focus solely on this research. 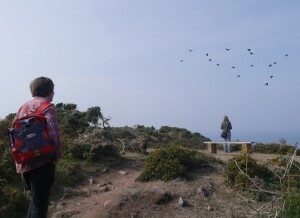 Ali and Ray Hales came over to Jersey to watch their parent-reared chicks take to the skies. They missed the first few days when the chicks were having limited time outside but then very quickly five hours became ten hours and on the day Ali and Ray returned home the chicks were given full access outside. Photos from their time here can be found on their website here. 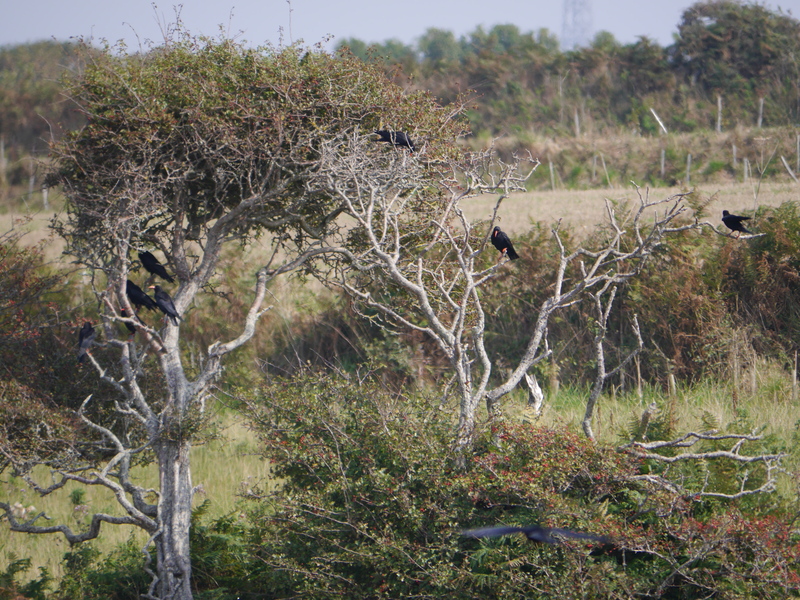 Ali was so impressed by the choughs’ progress that she immediately started arranging visits for her keepers. Fortunately parrot keeper Joe Thompson is also a pilot! This meant Paradise Park staff could visit Jersey in a day without disrupting their staffing rota too much. The first trip was made on the 23rd after two postponed dates through bad weather. Joe along with Adam Pollard and Olly Frost, who are responsible for Paradise Park’s choughs, had a whirlwind three and a half hour tour of Sorel and the Wildlife Park. 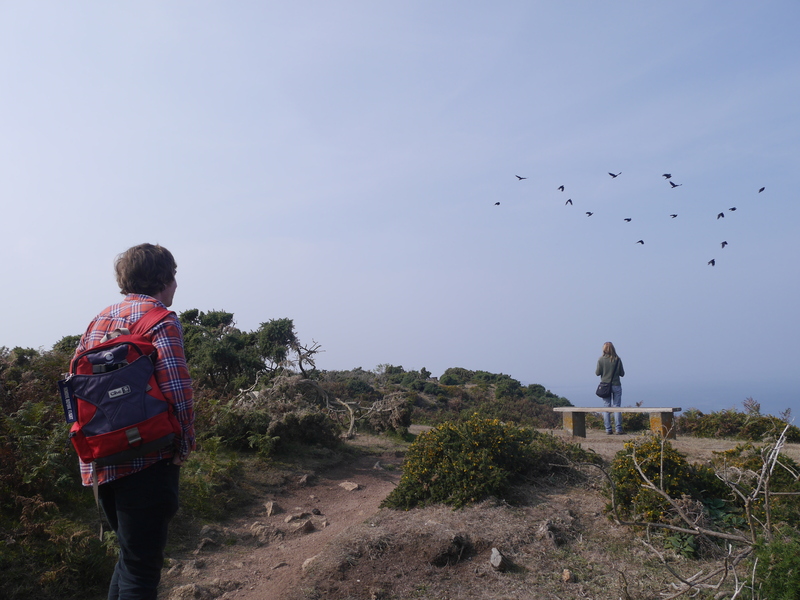 I think it is safe to say they were suitably impressed with seeing their birds flying around the cliffs. Sadly, bad flying weather and reduced daylight hours have now meant any further trips from Cornwall are postponed until next spring. An annual butterfly transect was setup this year at Sorel and carried out by project staff. 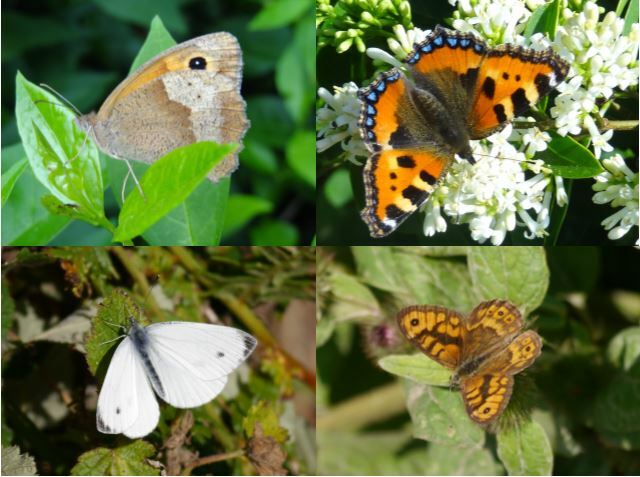 The survey runs from April to September counting butterflies on a weekly basis. 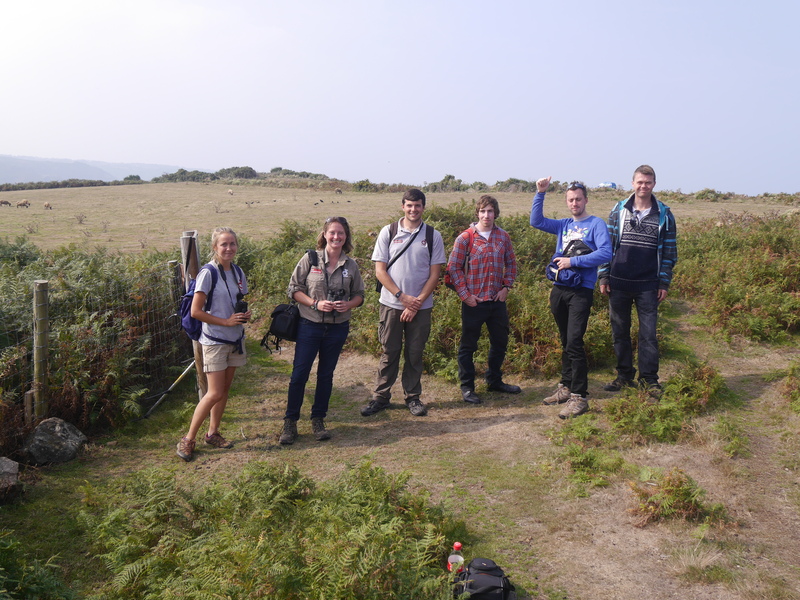 The transect is a new addition to the Jersey Butterfly Monitoring Scheme (JBMS) run by the States of Jersey Department of the Environment. 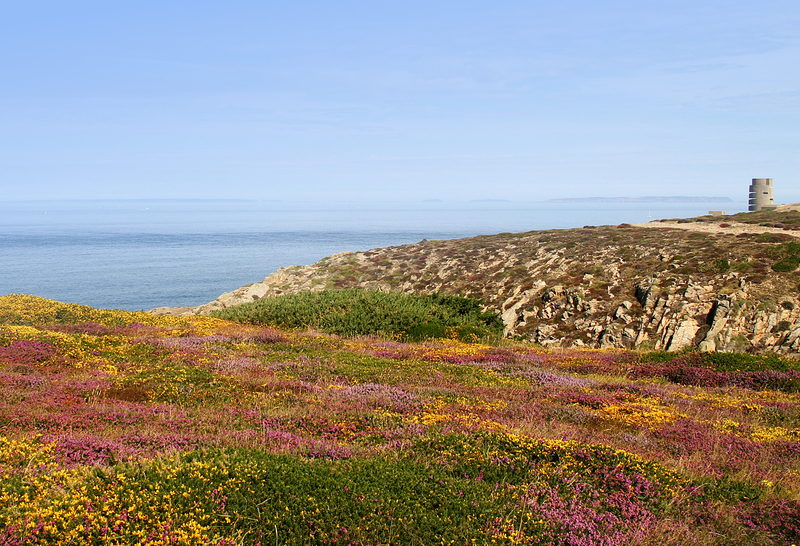 The overall scheme started in 2004 and uses the same methodology as the UK Butterfly Monitoring Scheme. The scheme is financed by the States of Jersey, but is almost entirely based on volunteer recorders. We are hoping the results will not only inform people about what can be found at Sorel, but show how the conservation crops can benefit butterflies. Data collected this year will be submitted to the States and results published later this year. 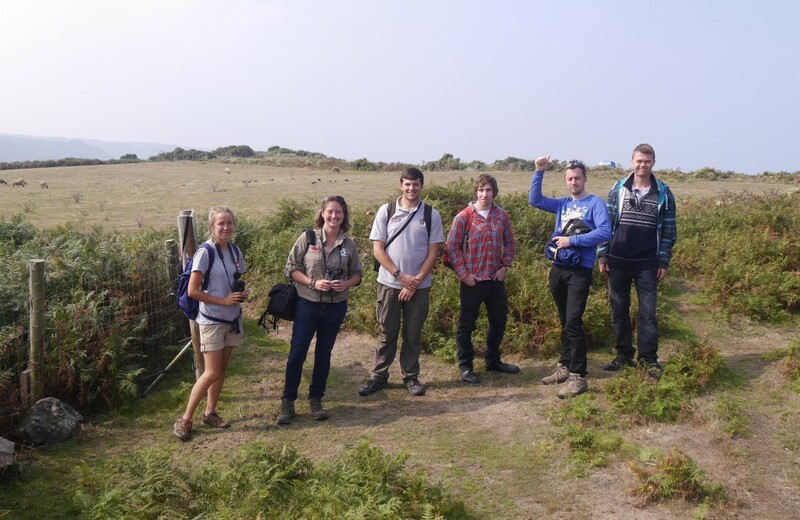 Durrell’s Overseas Team came over to Jersey between 8th and 13th of September for the annual Conservation Forum. 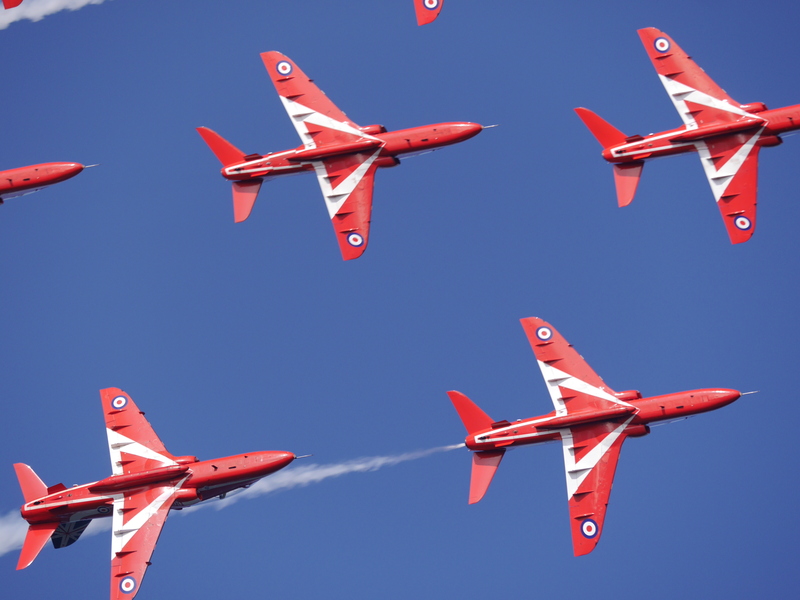 After several days of intensive management planning and workshops they were ‘rewarded’ with a trip to Jersey’s International Air Show. 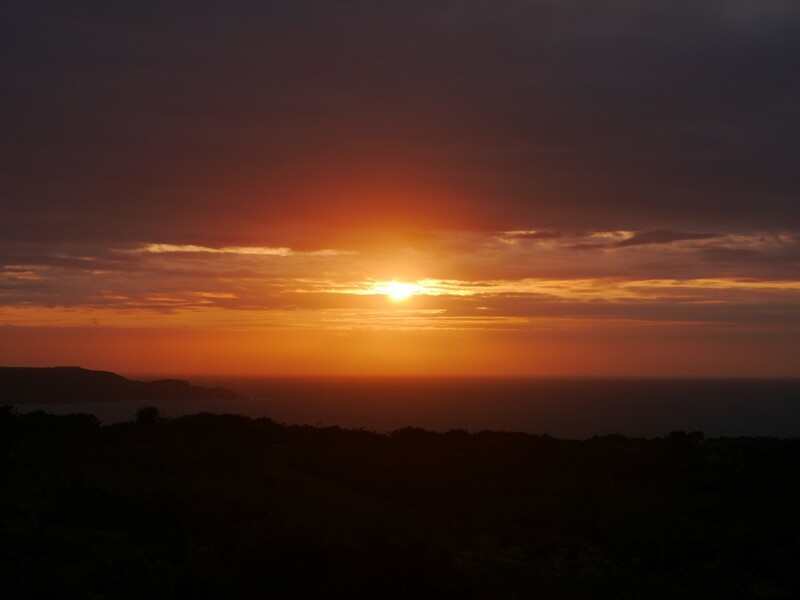 A fleeting visit to the not so secret viewpoint at Noirmont to watch the Red Arrows, followed by a close up view of the Lancaster bomber, and finished off with a sunset tour of Sorel. Our own aerial display team didn’t disappoint and flew over-head, dramatically dive-bombed the cliffs, then obediently returned to the aviary. The visitors were suitably impressed, especially considering last time they were here involved peering into a rain-soaked quarry looking for a lone chough. 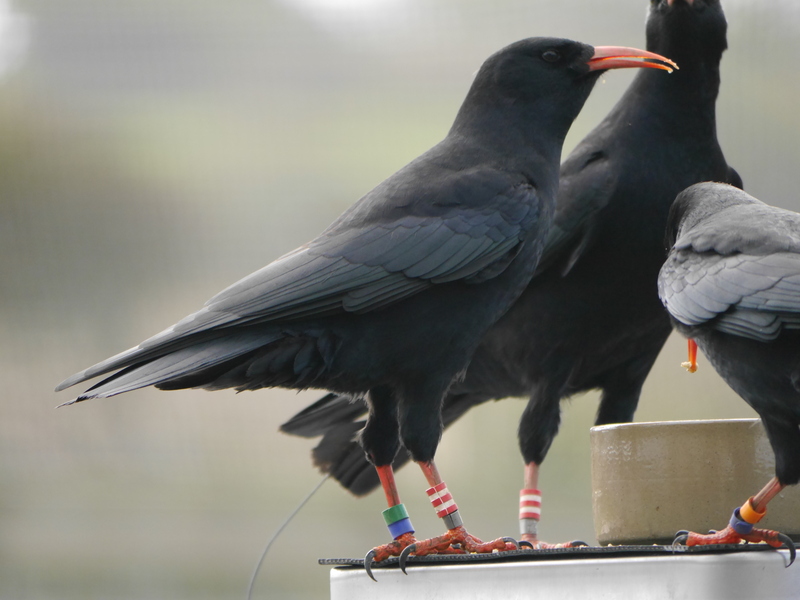 Many on the team have experience with re-introductions and restoration projects around the world and have advised with the chough project. 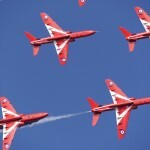 We were hoping for the ultimate photo opportunity of Red Arrows and red-billed choughs in one frame. 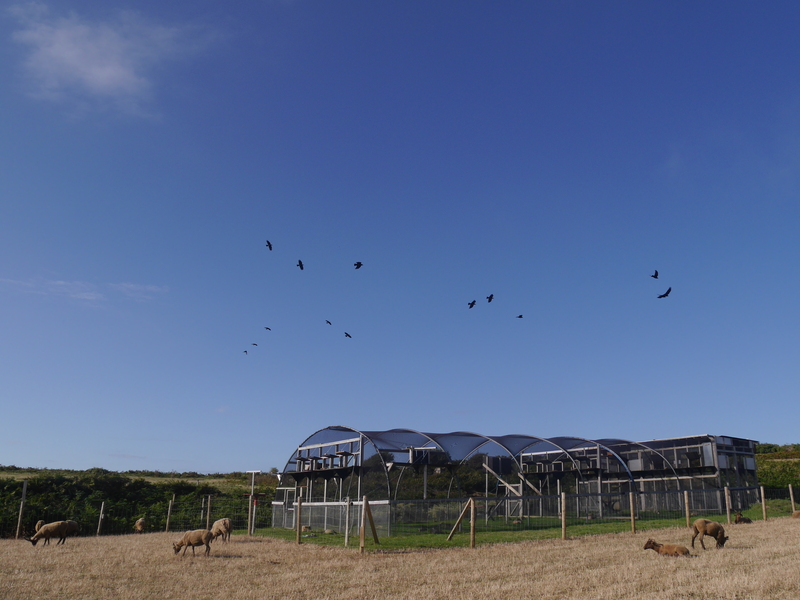 However, on hearing the approaching engines the choughs understandably headed straight for the aviary. Great update Liz, it’s a really great insight into how the birds are getting along. I’m really looking forward to a trip to Jersey next summer to see the Choughs again. A great report. Spectacular progress! What a tremendous effort by all concerned. Well done. Would love to have been a part of it. Fantastic report Liz, and super photos……all done with your usual sense of humour which makes it a joy to read what is actually a serious conservation project for Jersey…..can’t wait to return and see the choughs in full flight first hand! What an achievement for the whole team! I am now finally retired and I hope to spend quite a bit of time,browsing the island with a friend using 2 cars to cover more distance. The last time I went to the site was on the visit with Glyn as part of the course in the spring. can you let me know which is the best place to park and walk to see the birds and the aviary without disturbing the birds. Hi Stan. Many thanks. If you park in that gravel car park near Sorel Point, walk westwards along the cliff path (it’ll be quicker than the walk I made you do before!). Not long after you go through the sheep gate you will climb up a bit and normally you will see or hear the birds around here after only a few minutes. They do go down to Mourier Valley and Devil’s Hole at times but Le Don Paton is still the best place. Best of luck. 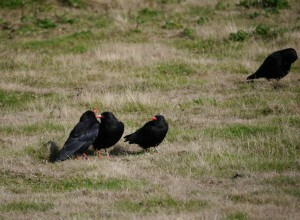 I saw a group of 10 choughs wheeling around over Beauport at 10.30am this morning. They were a wonderful sight. Well done for all your hard work. I’m glad you enjoyed the sight of the juveniles at Beauport. We will post news of their wanderings shortly.